As Arby's often reminds you, it has the meats. Now, the fast-food chain is also trying to prove it has the treats. 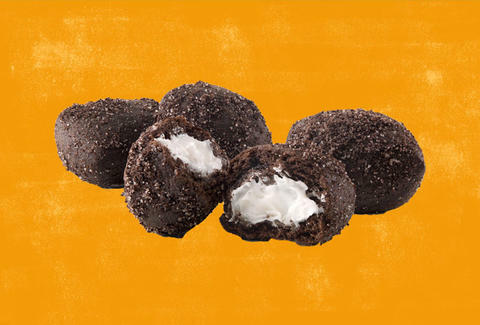 For a limited time, Arby's is serving warm Oreo Bites, which are just Oreo doughnut holes. Oreo Bites are fried chocolate doughnuts loaded with chunks of Oreo in the dough. Then, those little fellers are filled with Oreo créme and, the company says, "dusted with Oreo sugar blend." Oreo doughnuts isn't a new concept, but serving these balls o' sugar warm is a difference maker. This isn't a forever thing, though. The doughnuts are available now, but they will only be available through March. They cost about $2.59 for a six-pack.